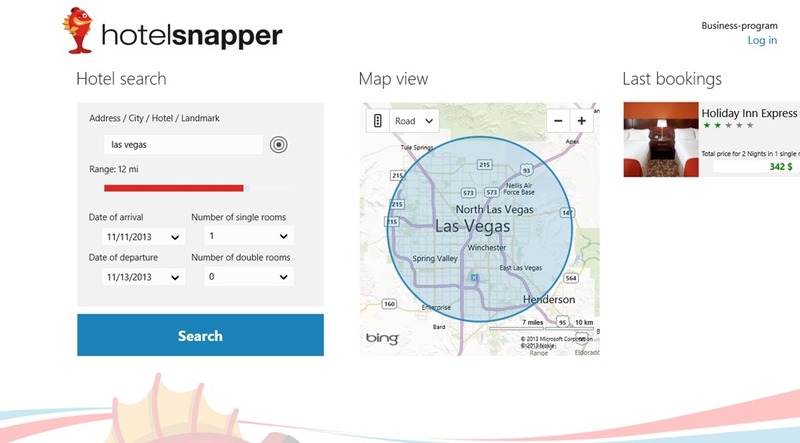 Hotelsnapper is a Windows 8 Hotel Finder. Hotelsnapper allows you to find hotels from around the world and book rooms there. It has a large database of around 300,000 hotels. 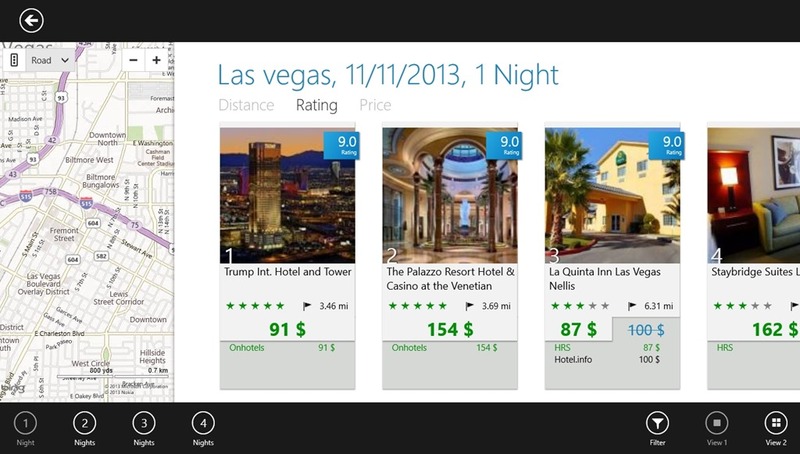 Not only this, this Windows 8 Hotel Finder will provide you with the best deals while you book rooms. Use the inbuilt map facility of the app to locate it. You can also filter your results to better suit your Budget, regarding the facilities and amenities you want, and some similar kind of status. You can even change the currency in which the charges are shown. So, it is more convenient to use this app. You can find it in the Travel category of the Windows Store. As you land into the app, you would be having the option to search for the hotels just by providing the name of the City, Landmark, Hotel, or the address of the place for which you want to find the Hotels. Apart from that, provide the range (area radius) within which you want the hotel, date of arrival and departure, and the number of rooms you want to Book. 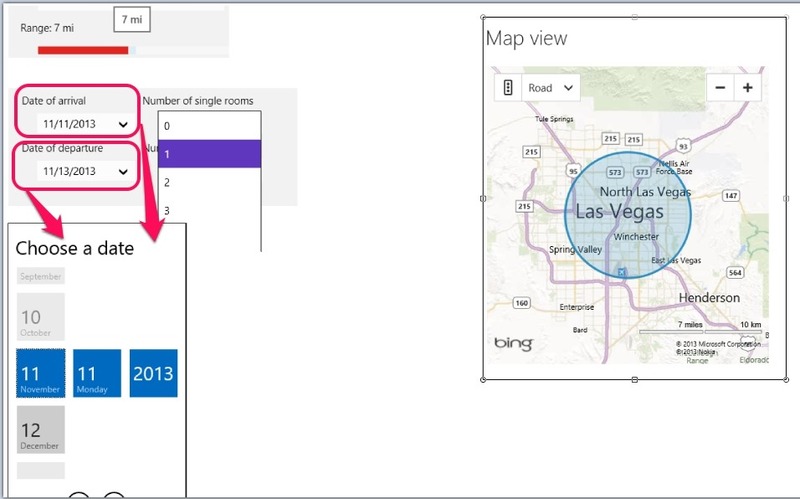 As you specify the name and range of the area for which you want to search, this Windows 8 Hotel finder will show you the map of the location for which you are searching. As you enter all this relevant information to search for the Hotel, this Windows 8 Hotel finder will provide you with the results for your search. On this page, Hotelsnapper will show the hotels with their cost of booking, their distance, and also the Ratings given by those who have stayed there. Now, here, this Windows 8 Hotel Finder also gives you the capability to filter your results according to the facilities you want in the hotel, leisure activities you are interested in, and the room amenities. 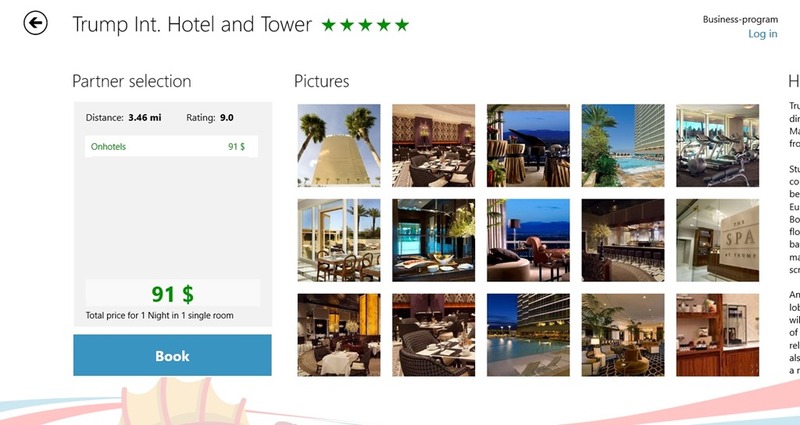 Choose the price from here and the lowest rating according to which the results should appear in this Windows 8 Hotel Finder. 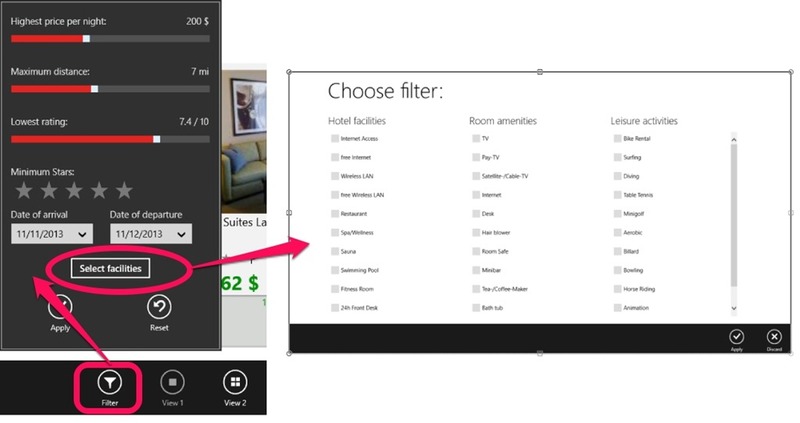 Now, according to your preferences you set in the filter option of this Windows 8 Hotel Finder, the hotels will appear in front of you. If you select any hotel appearing here, you will be shown the facilities, price, Hotel Description, and other things like images from the hotel. In addition to that, Book option will also appear here. As you use this option, this Windows 8 Hotel Finder will open the Booking page using your Windows 8 IE app, from where you can book your room. Also check Booking.com and Places Near Me. It provides a large database of 300,000 hotels worldwide. Filter your results according to your Budget. Book right from your Windows 8 Device. Use the maps of the app to locate the hotels better. According to my experience, this is a nice Windows 8 Hotel Finder.You have the capability to search from a large database of 300,000 hotels worldwide. In addition to that, filter your results according to your Budget and facilities you are looking for. All in all, a good app, Hotelsnapper deserves a try for sure. Don’t forget to share your experience with us.